official website of Bhopal Gas Tragedy Relief and Rehabilitation is www.bgtrrdmp.mp.gov.in and submit the application form along with the relevant documents is on or before 03-11-2018. The candidates will be shortlisted based on the interview and merit list. For other information of age limit, salary, application fee, and how to apply are given below for the posts of Medical Officer in Bhopal Gas Tragedy Relief and Rehabilitation Recruitment Notification 2018. The age limit for the candidates apply for the Medical Officer Posts is in between 21 – 65 years as on 01-01-2018. The upper age limit relaxation will be applicable as per the Government norms. The education qualification for the Medical Officer Jobs is candidates should have done MBBS Degree from recognized University. The salary offered for the selected candidates for the post of Medical Officer is Rs.50070/-. The application fee for the candidates belongs to Gen/OBC category is Rs.500/- and for the SC/ST candidates is RS.250/-. The candidates will be selected based on the interview and merit list. 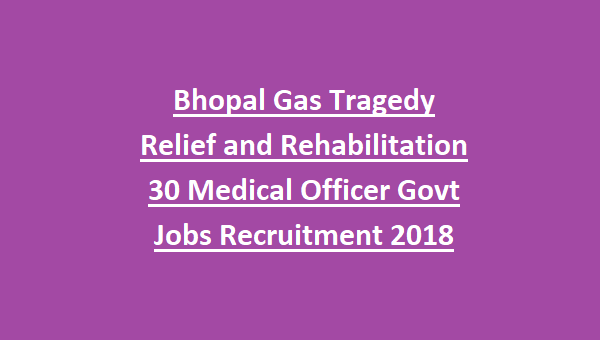 Interested and eligible candidates can apply these jobs through downloading the application form from the official website of Bhopal Gas Tragedy Relief and Rehabilitation is www.bgtrrdmp.mp.gov.in and fill the application form with necessary detail and then submit the application form along with the relevant documents is on or before 03-11-2018 to the address of Directors Office, Kamala Nehru Medical Office, Gas Relief, Hamidia Hospital Complex, Bhopal-Pin Code-462001. 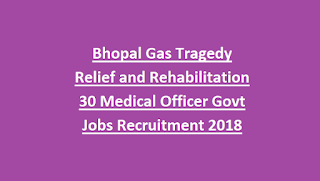 Candidates can download the application form from the official website of Bhopal Gas Relief and Rehabilitation for applying Medical Officer Posts is www.bgtrrdmp.mp.gov.in.